Think of your work groups, your extended family, your soccer team, a film or book club or your local community group. Consider more generally other groups that are central to the way you define yourself: your gender, nationality, ethnicity or religion. Some of the groups you belong to may be highly regarded by others. For instance, your work team may have high status within your organisation because it consistently outperforms all other teams. However, other groups that you belong to may be ranked much lower in the social pecking order (e.g. you may live in a relatively run-down neighbourhood). Other groups you belong to may not only have low status, but may face outright prejudice and discrimination in society (e.g. groups based on a sexual orientation, ethnicity or religion). While it is not hard to understand that people feel better when they belong to a group that is esteemed and has high status in society, it may come as more of a surprise to learn just how much the status of our groups affects our mental and physical health. There is now a wealth of sociological and epidemiological studies showing the profound role that social status and disadvantage play in determining health outcomes. As just one illustration of the magnitude of these effects, in his 2015 book The Health Gap, Michael Marmot observes that in the poorest (i.e. 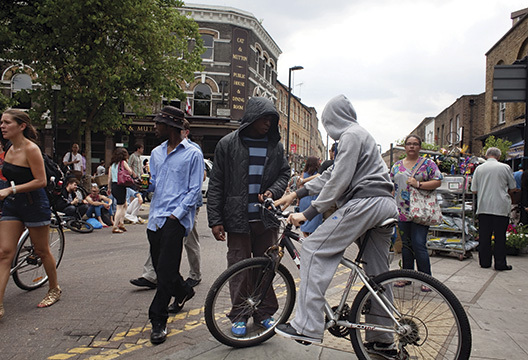 lower-status) parts of Tottenham, the life expectancy for men is 17 years lower than it is for men living only a dozen tube stops away in affluent Kensington and Chelsea. In Glasgow, the life-expectancy gaps for men between 1998 and 2002 were even more pronounced. So while in upmarket Lenzie a man was expected to live to 82 years of age, in the poor parts of Calton, just seven miles away, it was only 54. Testament to the fact that this gap is at least partly affected by the effectiveness of social policy, in Glasgow by 2015 this difference had been reduced from 28 years to around 20 years. Nevertheless, the stark differences here (which are replicated around the world), underscore the point that health has powerful social determinants. Thus, as a tongue-in-cheek counterpoint to traditional recipes for health of the form summarised in the first list that Alex Haslam presents in the previous article, Dennis Raphael (2000) has presented an alternative list of health tips – this speaks to the fact that health flows at least as much from collective (dis)advantage as it does from personal-level factors. Don’t live in a deprived area. If you do, move. Claim all the benefits to which you are entitled. Be able to afford your own car. Use education to improve your socio-economic position. Similar negative health effects are observed when people are exposed to stigma and discrimination. To clarify the nature of these effects, in 2014 Michael Schmitt and colleagues conducted a comprehensive meta-analysis of 328 studies that examined the relationship between discrimination and mental health outcomes. This revealed a highly reliable, moderately sized correlation (r = -.23 between perceived discrimination and mental health, such that the experience of discrimination is associated with less positive and more negative mental health outcomes (e.g. lower self-esteem and life satisfaction, but higher depression, anxiety and psychological distress). When it comes to explaining why disadvantage and discrimination are associated with poor health, there is, of course, one simple explanation. This is that people who have low status and face material deprivation may simply not have the means to maintain a healthy lifestyle. Their budget does not run to such things as healthy food and fitness clubs. Likewise, those who face stigma may stay away from health professionals who they fear will not provide them with the same level of care as they give individuals from more advantaged groups. Yet while these explanation are certainly true, it is also clear that they are not the whole story when it comes to understanding the health gaps between rich and poor and between advantaged and disadvantaged individuals. We need to understand more clearly the processes through which status and stigma affect our health. In the case of social status, to understand why the status of a person’s groups affects their health, we need to take account of the fact that individuals are in important ways defined by the social groups to which they belong. It follows that when a person’s group has high status, this reflects positively on them, but that when a group has lower rank this puts them in a negative light. The impact of group memberships on our wellbeing is especially pronounced if individuals identify highly with that group so that it is internalised as an important part of the self (Turner et al., 1987). If a soccer team is relegated, for example, it is its die-hard fans who suffer most. More seriously, this is why people who identify with their work often find retirement both difficult and painful. When they no longer have their work, something of their self is lost too. Some clinical evidence that supports this reasoning is provided by a 2010 study that Fabio Sani and his colleagues conducted with two populations: prison guards in Italy and families in Scotland. In both populations, respondents’ sense that the groups they were members of had relatively high status was associated with greater psychological health in terms of lower perceived stress, lower depression, and greater satisfaction with life. Importantly too, in both cases, this effect was explained by stronger identification with groups that were seen to be of higher status. A similar explanation helps to understand why being the victim of discrimination has negative health effects. Stigma typically involves discrimination and exclusion on the basis of group membership. So when that group membership is an important aspect of one’s self (i.e. one’s social identity), discrimination not only means that ‘my group’ is excluded, but also that, by definition, ‘I’ am excluded and not welcome. In short, if your group really matters to you, then group-based discrimination becomes personal. And that both hurts emotionally and damages the self. Despite the importance of status and stigma for health and wellbeing, it is also clear that members of disadvantaged groups are not necessarily condemned to have poorer health outcomes than their higher-status and stigma-free counterparts. In particular, this is because even though defining oneself as a member of a socially disadvantaged group will tend to compromise self-esteem – and hence have negative consequences for wellbeing – the first instinct of those who have low status or who are stigmatised is not to resign themselves to their dismal fate. Instead, they continue to search for a positive identity. What is more, while disadvantaged and stigmatised group memberships often harm health, the same group memberships are often also instrumental in countering those threats to health. In other words, the same social identities that are experienced as a ‘social curse’ can also be a major source of ‘social cure’. This is rather ironic because it implies that for those who are members of a disadvantaged or stigmatised group, their group membership is both a cause of negative health effects and the key to helping them overcome those negative effects. How does this work? More particularly, isn’t it the case that leaving a disadvantaged and stigmatised group is the most obvious way to avoid negative wellbeing outcomes? Well, it turns out that the answer to this second question is often ‘no’ – those who leave disadvantaged groups do not always secure better wellbeing outcomes than those who stay. As evidence of this, a 2002 study from Tom Postmes and Nyla Branscombe found that black Americans who engaged in individual mobility by moving to white neighbourhoods and seeking employment in white areas often had poorer health outcomes than those who had stayed. This can be explained by the fact that those who continued to live and work in black communities reported receiving more social support and being more accepted by their neighbours (i.e. other African Americans), whereas those who moved often felt rejected both by the communities they had moved into and those they had left. Here too there is also good evidence that the more people identify with a disadvantaged or stigmatised identity, the better their health and wellbeing. This was the conclusion reached by researchers who conducted a household survey study with people living in disadvantaged areas of Limerick in Ireland (McNamara et al., 2013). This found that those who identified most strongly with the disadvantaged community reported higher wellbeing. Further analysis showed that this was explained by the greater sense of collective efficacy among those who identified more strongly with the community. High-identifiers’ better wellbeing was thus explained by their belief that they were coping collectively with the challenges that their community as a whole was facing. Surprisingly perhaps, group identification also proves to be protective of health even when the group in question is the target of discrimination and prejudice. In particular, a vast literature now shows that people are more likely to be able to cope successfully with stigma when they can band together with other members of their group and collectively address their difficulties, rather than dealing with them on their own. This is because it is only when they act in terms of shared social identity that individuals are able to draw upon the psychological resources that group membership uniquely provides and this proves to be critical to health and wellbeing. As other articles in this issue explain, these resources centre on the experience of support, belonging, control and meaning (see Haslam et al., 2018). Returning to the list of tips for health that we presented at the top of this article, we can see that while it has integrity as it stands, it could also be augmented. Yes, it is true that health and wellbeing are products of poverty and disadvantage as well as of stigma and discrimination. However, the solution may not be to simply abandon these groups in the way that this list suggests. Indeed, as the list itself implies, even if you wanted to follow the tips this is not always easy. For most people becoming a lone parent, living in a low-quality housing, or working in a low-paid manual job is not a lifestyle choice but a fact of life. Yet even in cases when one is stuck in a disadvantaged or stigmatised group, all is not lost. Health and wellbeing can still be preserved, protected and even enhanced. Ironically too, this is best achieved not by turning away from groups (as many of the recommendations on Raphael’s list suggest), but by turning towards them. Seek out others who face similar forms of disadvantage and stigma, build a community, provide social support to others and receive support from them in return. For example, join a single mum support group (such as www.singlemothersunited.org/about-us) or take part in recovery walks for people who have overcome addiction (see Best et al., 2013). It is, then, by building shared social identity that negatives can become positives and that stigma can become strength. For this reason, we suggest that at least one more recommendation should be added to the list: ‘If recommendations 1 to 10 fail or are not possible, consider turning to others who are disabled, poor, sole parents, living in your community, or working in the same low-paid manual job as you do, and work as a group to challenge the shared injustices you face.’ It’s not easy, and not a magic bullet; but taking on board this lesson from social identity research may be the most curative strategy of all. Best, D., Loudon, L., Powell, D. et al. (2013). Identifying and recruiting recovery champions. Journal of Groups in Addiction & Recovery, 8, 169–184. Haslam, C., Jetten, J., Cruwys, T., et al (2018). The new psychology of health: Unlocking the social cure. Abingdon: Routledge. McNamara, N., Stevenson, C. & Muldoon, O.T. (2013). Community identity as resource and context. European Journal of Social Psychology, 43, 393–403. Marmot, M. (2015). The health gap: The challenge of an unequal world. London: Bloomsbury. Postmes, T. & Branscombe, N.R. (2002). Influence of long-term racial environmental composition on subjective well-being in African Americans. Journal of Personality and Social Psychology, 83, 735–751. Raphael, D. (2000). Health inequities in the United States. Journal of Public Health Policy, 21, 394–427. Sani, F., Magrin, M.E., Scrignaro, M. & McCollum, R. (2010). Ingroup identification mediates the effects of subjective ingroup status on mental health. British Journal of Social Psychology, 49, 883–893. Schmitt, M.T., Branscombe, N.R., Postmes, T. & Garcia, A. (2014). The consequences of perceived discrimination for psychological well-being. Psychological Bulletin, 140, 921–948. Turner, J.C., Hogg, M.A., Oakes, P.J. et al. (1987). Rediscovering the social group. Oxford: Blackwell.